It’s officially winter which means it’s time for warm nights in with loved ones, Christmas planning and enjoying plenty of hearty, healthy food. 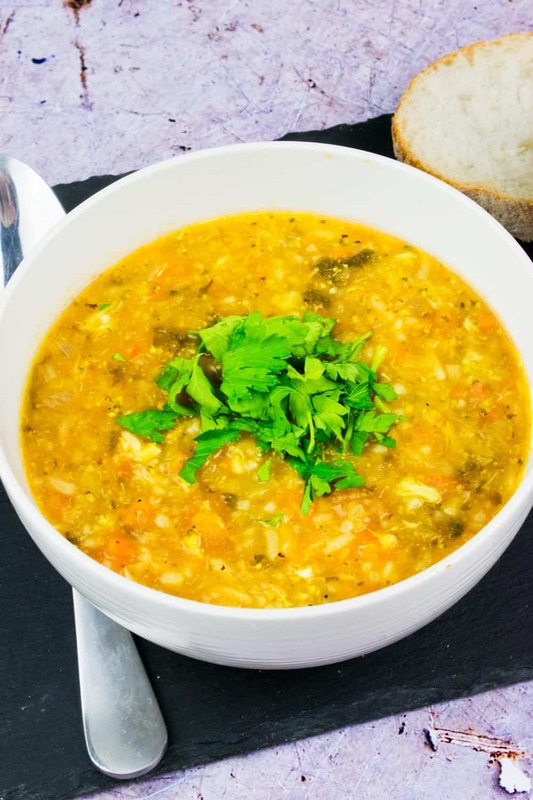 This Chunky Winter Vegetable & Rice Soup is thick, packed with nutritious veg and it’s mega filling, almost a cross between a vegetable stew and soup – perfect for keeping you healthy throughout the winter season. I’ve been laid up with a cold for the past week (not ideal when you’re seven months pregnant!) so I’ve been looking for ways to pack as much nutrition into my diet as possible, which is where this soup has come from. It’s a fantastic source of protein, vitamins and healthy carbs, plus the kick from the chilli really helps to clear your head if you are suffering from a cold! 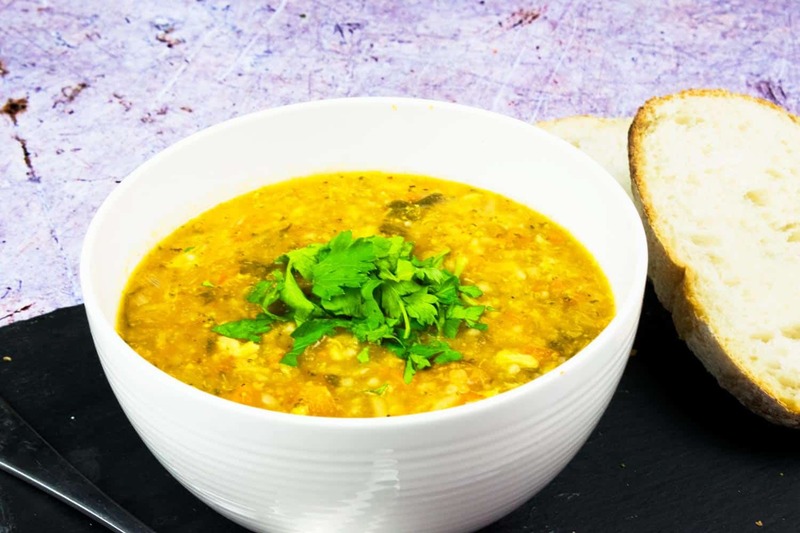 Soup is a wonderful choice if you’re following a healthy eating plan such as Slimming World. It’s perfect for meal prepping your lunches at work, or having in the freezer for days when you just don’t know what else to eat! 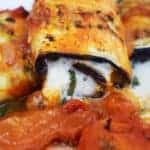 This recipe is totally syn free which means you can eat it to your heart’s content, plus because it’s packed with rice so it’s a really filling option to keep you going from lunch until dinner. Whether you’re enjoying a thermos of soup at work, or a hearty bowl with your family, it’s a real crowd pleaser. This recipe is suitable for anyone following a healthy lifestyle as it’s packed with nutrients from the vegetables and healthy carbs from the rice. For an added health boost pick a brown or wild rice. 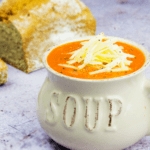 You can also rest happy knowing that this soup is a vegetarian option and is totally gluten free as long as you make sure to check the label on your vegetable stock. 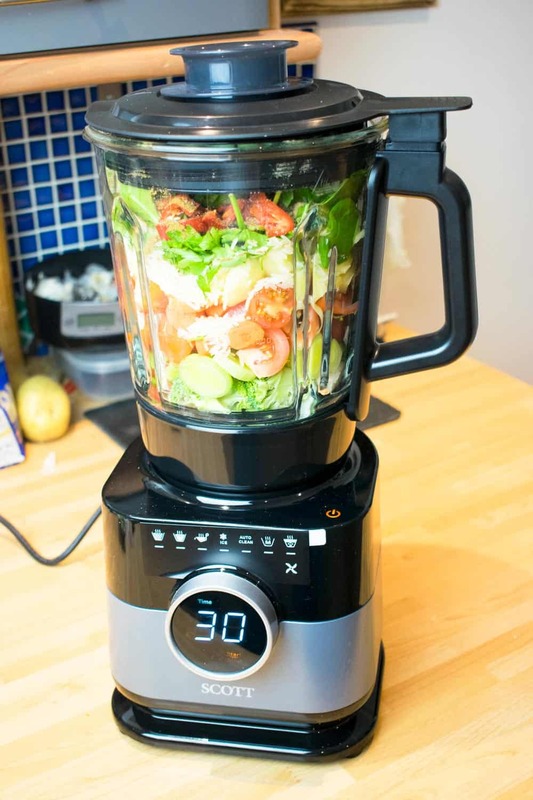 I was recently lucky enough to be offered the chance to test out my new favourite kitchen gadget, the Scott Simplissimo Chef All In One Cook Blender! 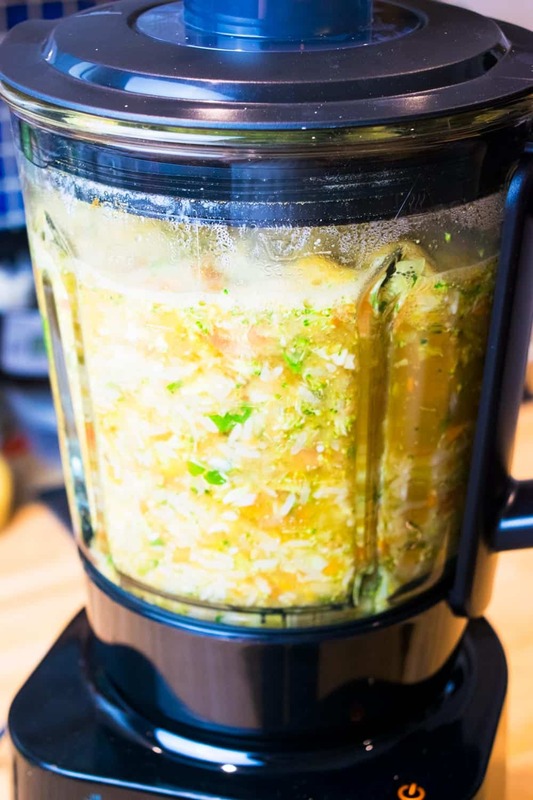 I will be sharing a full review of this fascinating multi-functional blender (once I’ve tested out a few more of its functions) but to make this recipe I was able to test out its soup making capability and I have to say that I was incredibly impressed. The wonderful thing about the Scott Simplissimo Chef for making soup is that it is about as low maintenance as it comes. It is quite literally a case of adding all of your ingredients into the blender and let it do its thing. The blender has two modes for soup, chunky and smooth, and for this recipe, I used the chunky setting. It was a perfect discovery for me, as my existing blender does not have enough capacity to blend up soup! I can’t tell you the number of times I’ve had to clean up spilt soup from my countertops after pouring soup between the saucepan and the blender, but this fixes that problem completely. It gently cooks the ingredients whilst gradually blending it to the perfect consistency and it is my new go-to for soup making from now on! 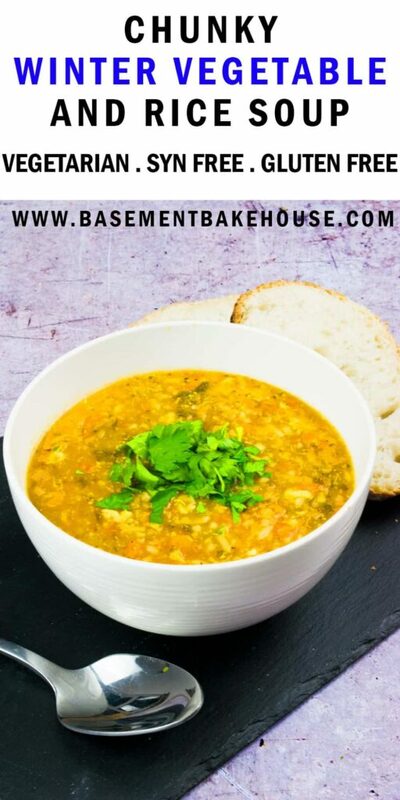 If you haven’t got your hands on a Scott Simplissimo Chef yet (you can buy one via their website or on Amazon) then you can make this Chunky Winter Vegetable & Rice Soup in a saucepan or a slow cooker too if you prefer – but I seriously recommend buying yourself one of these sensational blenders! You can check out my full review (when it goes live) to find out more about its different functions. 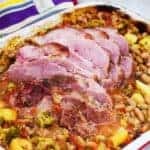 I’ve included the ingredients that I picked for this chunky soup recipe in the method below, however, there are lots of other veggies that you could include too. One of the beautiful things about soup is that you can use up what you have in the fridge, so if you have leftover veg that needs eating up don’t hesitate to include it. 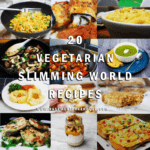 In addition to the vegetables that I’ve featured specifically, this would work really well with courgettes, peppers, aubergines, butternut squash and loads more! 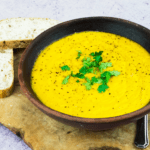 This is one of my favourite soup recipes, as it is packed with flavour, and has a spicy kick from the chilli and a warm depth of flavour from the cumin and corianderer, so I really hope you love it as much as I do. 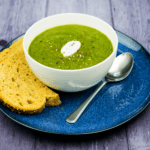 A delicious syn free winter soup recipe. Select the 'Chunky Soup' setting on your blender and press start. Leave to cook and blend for the suggested 30 minutes. Add all of your ingredients into a large saucepan. Bring to the boil on a high heat and then reduce heat and simmer for 30 minutes. Syn free on Slimming World. Syn values correct at time of writing. Please do not screenshot this recipe. To ensure that your soup is gluten free make sure to check that your vegetable stock is marked as gluten free. vegetarian. 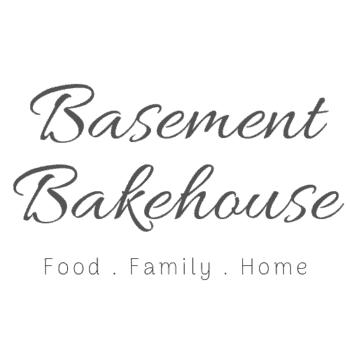 This recipe was created in collaboration with Scott UK but all views and opinions are my own. 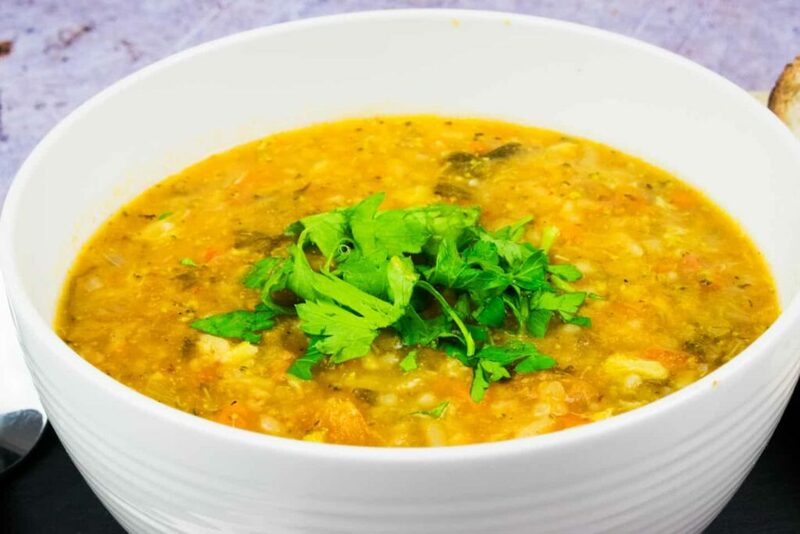 DON’T FORGET TO PIN THIS CHUNKY WINTER VEGETABLE & RICE SOUP RECIPE FOR LATER! I never thought to start a soup recipe in the blender! Looking forward to trying it! Totally awesome soup recipe. Pinning to make soon! I love healthy and hearty soup recipes like this, especially over these chilly winter months! And I totally love the idea of bringing something like this in a thermos for a work lunch- I'd feel SO prepared, not to mention healthy, if I had my act together to do that! I can see why this is a reader favorite. I love all the flavors and colors in this dish. Sounds delicious. I can't seem to get enough or make enough soups lately. I'm constantly craving them, and this recipe is calling to me. Loving all of those hearty chunks in there. Now all I need is a nice toasted slice of bread. Perfect. Wish I'd had this soup last week when it was in the 40's. Heading back to the 80's but will tuck away for our next cold spell. It looks delicious. Soup is my go-to in the fall and winter! I will be trying this for sure! This sounds so tasty! I love that I can use the veggies I like to make this vegetable rice soup. I would be tempted to add some grated fresh ginger. The Chinese use it in their traditional medicines for colds.